IEC 60287 "Calculation of the continuous current rating of cables (100% load factor)" is the International Standard which defines the procedures and equations to be used in determining the current carry capacity of cable. The standard is applicable to all alternating current voltages and direct current cables up to 5kV. This note will introduce the concepts adopted by the standard, provide some guidance on using the standard and direct the reader to further resources. homogeneous material The methodology taken to the sizing of cables is that of treating the issue as a thermal problem. Losses within a cable will create heat. Depending on the installation conditions this heat will be dissipated to the surrounding environment at a given rate. As the cable heats up rate of heat dissipation will increase. At some temperature the rate at which heat is being dissipated to the environment will be the same as the rate at which it is generated (due to loses). The cable is then in thermal equilibrium. The losses (and heat generated) are dependent on the amount of current flowing within the cable. As the current increases, the losses increase and the thermal equilibrium temperature of the cable will increase. At some given current level, the cable temperature at thermal equilibrium will equal the maximum allowable temperature for the cable insulation. This is the maximum current carrying capacity of the cable for the installation conditions depicted by the calculation. 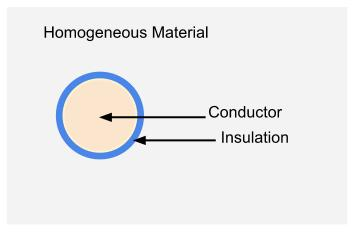 To illustrate the principle, we can consider a simplistic scenario of a d.c. cable (as shown in the illustration), surrounded by an insulating material and placed in a homogeneous thermal conducting material. (click to enlarge) The reality of any cable installation is more complex than described above. Insulating materials have dielectric losses, alternating current introduces skin effect, sheath and eddy current losses, several cables are simultaneously producing heat and the surrounding materials are non-homogeneous and have boundary temperature conditions. Within the standard, there are a lot of equations and it can be confusing to persons who are new to the method. However, a step by step working through it approach will enable the current carrying capacity to be calculated. 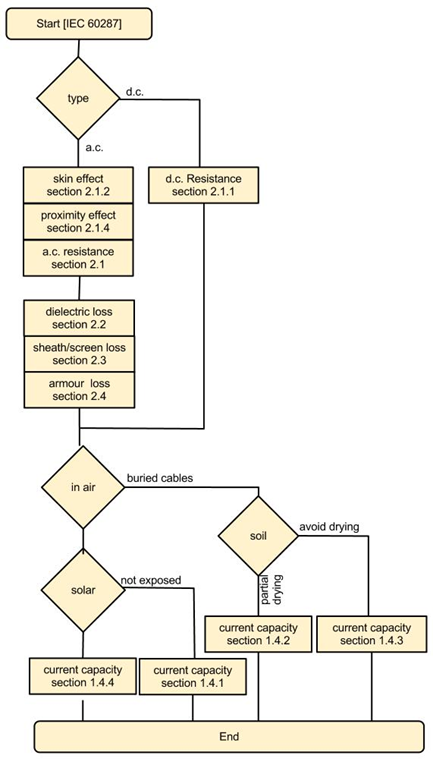 The flow chart shows one recommended path for working through a cable sizing exercise in line with the standard. Given the number of equations which need to be solved, it is tedious to calculate in accordance with the standard by using hand or manual methods. More practically software applications are used, which allow the sizing of cables to take place quickly. A quick Google search will turn up several software programs capable of performing the calculation. Tip: a cable run can move through different installation environments (for example it may start in a cable basement, more through ducts in a wall, be buried for some of the route, suspended under a bridge, buried again, through ducts and into the receiving building). In this instance the current capacity should be evaluated for each type of installation condition and the worse case taken. Within the note the IEC 60287 have been introduces and the problem of finding the current capacity of a cable boiled down to that of a thermal calculation. The note has given an overview of the contents of the standard, ways to navigate and perform the calculation and provided links to more detailed posts. Hopefully the note has achieved the objective of providing an introduction to the current capacity sizing methods of IEC 60287. If you have any comments or something is not clear enough, please post these below.